And so it came to pass that things progressed and I received a dinner invitation to his house. By myself! Oh joy! Oh rapture! I turned up at the appointed hour, floating on a cloud of perfume and happiness, not caring by that stage if he fed me cuppa soup and two-minute noodles. But wait: our boy has an ace up his sleeve! Once we had chatted and had a glass of wine, we finally sat down to our first dinner a deux and with a flourish he produced… stuffed gem squash. Clever clever clever. Not too girly, but definitely a cut above your standard meat-and-potatoes (or, God forbid, beans on toast!). By this stage, non South Africans are askign what the hell is a gem squash. Well, let me tell you – it is probably the thing that South Africans abroad crave the most, second only to biltong. In fact, when my half-sister emigrated to France in the 1970’s she missed gem squash so much that she smuggled a packet of seeds into France wth her and planted them in her garden there, just so that she could have a steady supply. As I discovered when I arrived in the UK, squashes aren’t that big over here. OK, so maybe they’ll carve a pumpkin at Halloween, but apart from that, you coudl say that the squash family (including things like butternut, kabocha/acorn and gem squash) have not made it big in the UK. At first I thought it was a northern/southern hemisphere thing, but in the US, squashes of various descriptions are very widely eaten. In the end, I think it may be a climate thing. Squashes are generally like heat and cannot tolerate frost and many types simply don’t grow that easily over here. Consequently, they have always been viewed as something rather exotic and best avoided by those with conservative palates! Some of my English friends still view dishes cooked with butternut squash with a huge degree of suspicion and declare them to be “an Antipodean thing”. But having said that, at least butternut is now available in pretty much every supermarket, while gem squash is available reliably at Waitrose and sporadically other supermarkets. Hurrah! Now gem squash falls into the summer squash category, but I must say that the gem squashes vary greatly in terms of how thick their skin is – I guess this is a function of how early or late they were picked. The ones we get in we get in South Africa (often sold by the roadside in 5 or 10kg bags!! And sooooo cheap!) tend generally to be pretty thick-skinned and once cooked, hold their shape. Over here, however, they live up to their description and the skin is often soft enough to eat once cooked. On the other hand, in South Africa we get baby gems – approximately the size of ping-pong balls and cooked in the blink of an eye. You just eat the whole thing, no mess, no fuss – and they are SO sweet and delicious. (I think these may be available elsewhere labelled as “8 ball” squashes?). You can do what my dad still does to this day: slice the squash in half around its equator, boil (or steam or microwave) until the flesh is soft enough to scoop out the pips easily, add a knob of butter in each hollow, mash the flesh inside the skin and season with cinnamon sugar. Alternatively, if the idea of sweet vegetables is off-putting to you, try the same idea but with sea salt, black pepper and thyme. I have even mashed mine up with a balsamic dressing which worked well. Prepare and steam the squashes as above, then fill each hollow with a spoonful of vegetables of your choice mixed with pesto and serve (also ideal as a vegetarian meal). Prepare and steam the gemsquashes as above (one squash per person). While they are cooking, fry the onion and garlic in a little olive oil until soft. Add the mince and fry gently until cooked. Add the chopped tomatoes, the sauces and seasonings – taste to see if anything else is needed. Chopped chillis can also be added if your taste runs to spicy. When the meat mixture is heated through, place the gem squash halves on a baking sheet and scoop out the pips, leaving the flesh. Fill the hollow of half with the meat sauce, sprinkle with grated cheese and top with breadcrumbs. Grill until the cheese has melted and the crumbs are browning, then serve with a big green salad and wait for your guest to fall hopelessly in love with you. Mmm Yum! 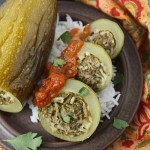 When I was in South Africa for a month last summer stuffed gem squashes were my favourite dish. we had them with chickpeas, onion and lots of cheese, I just loved it! LOL! It’s not just men who the way to the heart is through the stomach? Sounds very yummy. My Tesco has recently been getting in more than the usual pumpkin, acorn and butternut so I shall have to check it out. A dollop of golden syrup in mashed squash is a favorite of mine so I will definitely try your dad’s recipe out too. The good old gem squash, fondly referred to in my South African childhood home as the sqaushy. Evberybody’s favorite as we were growing up. I must admit I do miss it out here in the states and the butter squash I substitute it with is not bad, but it is not that gem squash. My mom filled it with a mince smoortjie and topped it with cheese. That’s how I now do the butternut squash. Wow Jean this brings back memories. Mmmm, I’m missing home now 🙁 Nice to see you blogging, amongst other things, about SA. Really like your blog. Do drop in on mine sometime. I love butternut squash, it has a great wintery flavour, not too dissimilar to late season roasted parsnips, they do all seem to be imported into the UK though. Sweet potatoes too, mmmmm, gently roasted sweet potatoes with proper pork chops (plenty of fat, rind still on). I got some gem squash from the farmer’s market last summer, where they were called canonballs:) I stuffed them as well – really cute! Well, hello! I just found this page because I was googling for , yes you guessed it: gem squash. I’m in Arizona. Does anyone have or know where I can get hold of some gem squash seeds in the US? I am dying for some and cannot get hold of any seed here. Help!!! Hey, thank you for an awesome article. I am from Durban but have lived overseas (UK and now Australia) for almost 9 years. When I go back the first things I have to get my hands on are a cold Amstel, a stick of biltong and a gem squash. I have been thinking about gem squashes a lot lately and explaining to my English girlfriend how, when we go to SA together, we will have them. Then, to my surprise, we were in our local vegetable market and there they were! Smaller and harder than their South African counterparts but gems nevertheless! So I did a quick Google search and found your entertaining blog which also reminded me how to cook them (I left SA at 19 and hadn’t done much cooking!). Thanks again! Please please please can anyone tell me if they know of somewhere in the UK or website than I can get Gem Squash!!!!!!!!!!!!!! I MISS It and this recipe has made my mouth water. Any help will be appreciated. I am in the midlands in Stratford Upon Avon. Love the things and miss them terribly. I have some seeds and planted them last spring. (I live in Southern Spain so reasoned that they would grow well). Disaster, grew to half size then rotted. Perhaps I watered too much. I remember them in our back yard in Zim just growing out of the seemingly dry packed earth. So can someone advise me how to grow them, soils etc. I have hoarded some seeds so would appreciate any help. Live in Melbourne, Australia, have seeds but no instructions on how, when, etc to grow, can anyone help. Mouth watering stuff!! Oh yes – I definitely rank gem squash as one of my most missed foods. I’ve searched in vain for it here in the States. I managed to find hubbard squash one year, but alas, no gems in sight. I buy the little acorn squashes though and cook them the same way – cut in half and baked or boiled – but they’re not as sweet. Just curious: I have heard that the Gem squash has absolutely no nutritional value……… Is this true. Abel & Cole (www.abel-cole.co.uk) sometimes include gem squash in their organic fruit & veg boxes. Some came in the box just today! If you’re not on a box delivery system, I presume that you can order them solo from Abel & Cole as well. Thanks for the suggestions on how to cook them…I had no idea what to do. We have done this for the last five years: Save seeds to plant the following year. And, if you need instructions: To grow (and cook) Gem Squash, follow any guidelines you may find for Acorn Squash. I have been advised that you can purchase Gem Squash in Asda’s, happy shopping. Since making the offer, I have received one or two requests a week. This week, three. All requestors get a few dozen seeds. I have plenty of seeds left. I actually do not care if you live in the USA or not. Just get me an envelope with sufficient USA postage stamps to reach you. Maybe the Customs will catch it, maybe not. What is great are the letters that people enclose with their requests. Seeds have gone to Alaska (short growing season, but 24 hours of sun! ), to all kinds of ex-pats of Southern Africa, and to some who were visitors to ZA. Today, I even had an e-mail from Australia asking, not for seeds, but for growing directions. To harvest the seeds: Leave the squash on the vine until the vines die back. (Or, buy mature squash that are not all green but have a touch of yellow / orange colour on their skin.) Halve the squash, and scoop out the seeds before cooking. Rinse the seeds to remove them from the squash strands. Dry the seeds at room temperature for a couple of days, then store them in a resealable plastic bag. I’m seeking some Gem squash seed in Australia. Any chance? hopefully will have a bumper crop of gem squash next month… got seeds in SA last year and planted them late this spring( in ADKS mountains of NY ) if anyone wants seeds , pleae contact me . I am english, married to a south african and living in the Rhode Island I was given 1/2 a packet of gem squash about 4 years ago, I planted them this summer and my garden has been overrun with delicious gem squash, I will be saving some seeds for next year. I planted so many, not sure if they would germinate, but they went gangbusters and grew over the lawn for yards! I’m a Rhodesian ex-pat and amazed to find so many others missing gem squash. I have tried butternut squash, but find it rather bland in comparison. I managed to get some seeds many years ago, but as they were so valuable to me I hoarded them like gold bullion and sadly they are now inactive. Thanks to comments from others I will now pursue replacements aparrently available in the UK. I do miss them very much (as well as boerewors but don’t hold out much hope for that item as well). Is there any way to still get gem squash seeds? I live in So Cal. and have not been able to find any. Thank you. I ate the first gem squash of the season last night, from seeds that came by mail from SA….oh they were so good! I had forgotten how good they are! As for Boerewors, I have a local butcher make it for me…the Canadians cant get their tongues around the word, so it is politely called South African sausage!! Even the locals are eating it now. The smell of it cooking on an open fire reminds me of braaivleis at the beach! Hi, I found some gem squash (or jam squash as my brother Peter used to call them when he was little and we lived in Hilton,near Maritzburg)on Sunday on my way back from Toowoomba, S.E.Queensland at Tomatoland! I was so excited as i haven’t seen any in Australia since emigrating nearly 14 years ago! I will plant the seeds and hopefully have some luck or buy seeds which I see now are available from some suppliers here in Australia. thanks for your intersting blog and great ides for cooking gem squash. I like them cooked in microvave, scooped ou seeds and then fill with cooked peas and a blob of butter. Lots of happy childhood memories there. Seems like they’ve cut and pasted your recipe, without acknowledgement. You can get it in Waitrose in the UK. I have just today received 2 gem squash in my organic veg box from Riverford. (riverfordnorton.co.uk. They deliver to most of England. Not sure if this “thread” is still active. I’ve got gem squash from Abel and Cole. Loved comments, didn’t know there was such a following for gem squash, as a Calgarian supply is very limited, to one month a year(imported by SA butcher shop). I was introduced by daughter-in-law ( an Aussie raised in SA). She is visiting parents in Aussieland and I would love to prepare and freeze the 8 gem squash I bought today before she returns next month. Wondering if I can cook and freeze like pepper squash or not. I’m a SA living in the UK. Is there anywhere that I can get hold of Gem squash and Boer Pampoen seeds? I’d love to grow my own! Hi Denver. Gem squash seeds are available from http://www.mammothonion.co.uk. Boer Pampoen seeds are available from http://www.tozerseedsdirect.com/seeds/squash-winter-seeds. Hope they grow. I’m planting mine today. My sister in SA has sent me gem squash seed (I’m in UK), which I grow every year. I never split the gems before boiling but pierce the shell at the equator. Once cooked I scoop the seed and discard and put the flesh into a collander and drain for half an hour. Then i put it back into a pot with some butter, salt, pepper and a tin of drained sweetcorn. Mix it all together until the butter has melted and either serve or freeze. I also split gems at the equator, scoop the flesh, put in a dab of butter, a little salt, pepper and nutmeg. I place them into vacuum bags and seal like that – uncooked. To cook, microwave or boil in the bag. I also grow Cape Gooseberries in the UK, if anyone is interested. If you are in Australia you can buy the seeds from the Diggers Club in Melbourne. They do mail order heritage varieties of plants and seeds. this is the address http://www.diggers.com.au/gardenHerons.shtml I do not have any financial interest in the company I just buy seed formy garden from there. I bought Gen Squash out of curiosity as lots of South Africans I know comment on them. I know have rampant vines and found your site googling when to pick them! Men’s Health Pharmacy, the online drugstore for erectile dysfunction and sexual needs. How much – pils – effect [url=http://buy-forzest.drugsrx.us/brand-forzest.html%5Dforzest 100mg – [/url] composition ? cheapest phentermine pills – american medical associsation..
A great way to serve gems. Remove pips and steam. Once cooked fill with tinned sweetcorn, top with grated cheese and a sprinkle of aromat. Place in oven to warm through and if necessary grill for a couple of minutes to brown top. It is very moreish. Just bought a lovely gem squash in the African Delights shop on Mowbray Road at Lane Cove. Also stocked up with boerewors, biltong, green fig and watermelon konfyt and Cape Gooseberry jam. The gem squash will be stuffed withj savoury mince and topped with cheese. Just to wet your appetite – also available at African Delights are koeksusters (I freeze them) and melktert, as well as droewors and sosaties!! It sounds delicious. I am on an eating plan with umpteen veggies to eat a day and I just can’t do them all just steamed or boiled. This looks wonderful and is on the menu for tonight so I will let you know.